Former NZWPW Champion Ben Mana has set his sights on another title. The Modern Maori Warrior will challenge Tank for the Anzac Championship in the main event of PWE Danger Zone. Mana knows he’ll be in for a fight against the tough-as-nails Tank, but claims dethroning Tank will scratch his growing itch for championship gold. Tank has already defeated one former NZWPW Champion. He claimed the Anzac Championship—a title PWE management has deemed can be defended in both Australia and New Zealand—in a tough bout against Rufguts last month in Reporoa. Everything Ben Mana is to NZWPW, Tank is to PWE. As the first PWE Northland Champion and the reigning Anzac Champion, Tank has held every title available to him in the Morrinsville-based promotion. Will Tank’s second title reign prove to be as short-lived as his first and end with Ben Mana taking the Anzac Championship back to Wellington? Find out tomorrow night at PWE Danger Zone. Also at Danger Zone, Stix has issued an open challenge for the PWE Northland Championship. The Rumbling Rocker from Reporoa told PWE management he wanted to be a fighting champion and give anyone who accepts a shot at the title he has defended against the likes of Charlie Roberts and James Shaw. Who will step up and—most importantly—who will leave with the title? Find out tomorrow in Morrinsville. 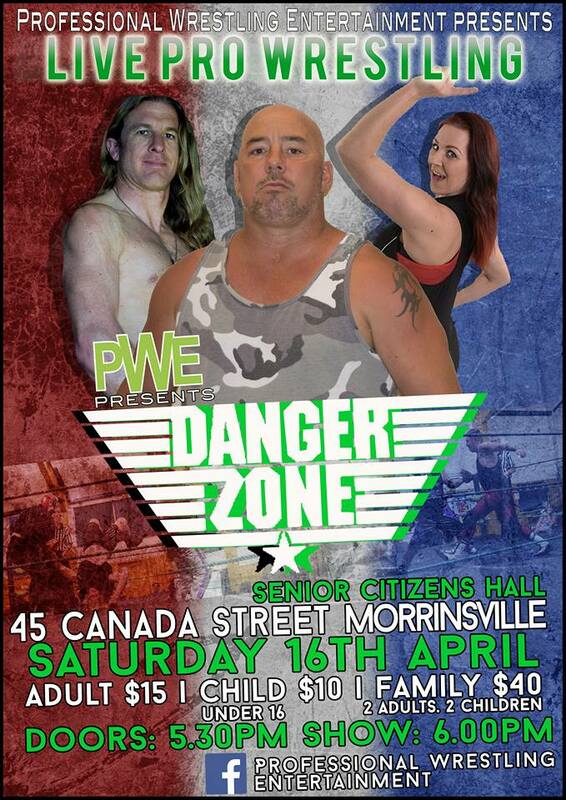 PWE Danger Zone takes place tomorrow, April 16, at the Morrinsville Senior Citizens Hall. Doors open at 5.30pm with the first match scheduled for 6pm. Tickets are available on the door ($15 adults, $10 children, $40 family). The card, subject to change, is listed below.